Conservatives have found it gratifying, not to mention amusing, to watch the Democrats finally reveal themselves to be the outrageous, shrieking, freedom-hating Commie loons we’ve always known them to be. Now comes the not-so-enjoyable part, where the Republicans recognize that the center-left position has been vacated, allowing them to move in and annex that territory for their own. Led by first-term New York congresswomen Alexandria Ocasio-Cortez, the Democratic Party has descended into self-parody by embracing a grandiose, eco-pinko initiative called the Green New Deal. This hazy collection of collegiate Marxist mindbarf, which promotes general goals rather than specific policies, seeks to eliminate the internal combustion engine, end industrial farming, provide every person with a job and lifelong economic security, and require every building in America to be reconstructed to conform to unspecified ecological, ergonomic and other standards. It could hardly be any battier if they adopted the whimsical proclamations made by the generalissimo in Woody Allen’s Bananas. In a jointly written op-ed, Republican congressmen Greg Walden, Fred Upton and John Shimkus opened by declaring, “climate change is real,” and went on to propose that we “encourage” research and innovation with the aim of combating it. What they mean by that, if you consult your handy Beltway-to-English dictionary, is that they mean to increase the already obscene amount of taxpayer money being fed into the most voracious boondoggle in the history of government. Meanwhile, in a separate piece written for USA Today, former Ohio governor and presidential candidate John Kasich advocated policies “based on responsible economic principles of free-market capitalism,” like a “carbon tax,” the imposition of more new taxes through a “cap and trade” system, and yet more “subsidies for electric vehicles.” If those sound like conspicuously anti-capitalist policies that the Democrats have embraced for the past quarter-century, that’s because they are. Seriously, for Kasich to characterize such violent governmental assaults on the free market as market-based solutions is like describing napalm as an herbal remedy. By design, there can be no free-market approach to combating “climate change,” because the doomsday scenario was concocted for the very purpose of stamping out free enterprise. To blame the imperilment of the earth on carbon dioxide is to identify human productivity as the culprit. That’s why the prescribed remedies have consisted of attacks against industry, wealth, and private property. There’s no conservative or even moderate version of that. What we’re seeing here, which should come as a surprise to nobody by now, is that the leaders of the GOP are not philosophically committed to conservative ideals – which is to say, they’re unprincipled. Their only philosophy is, if you have to join them to beat them, so be it. If the Republicans think they have to become the Democrats of the 90s in order to defeat the Democrats of today, then that’s just what they’re going to do. It can be said with total objectivity that former vice president Al Gore is a fearmongering maniac with delusions of grandeur. It is equally true that the party that is now endorsing his proposals for combating “climate change” is the Republicans, and not the Democrats, who must now view the father of the eco-alarmist movement as an overly-conventional, pro-establishment square. Is the difference between Gore and Kasich – the latter of whom claims divine endorsement of all his liberal policy positions – really so great? The only climate change that is real is the change in the political climate. As the Democrats recede into the fever swamps of the far Left, the Republicans make a play for the more mainstream liberal voters, confident that their conservative base can’t afford to leave them. 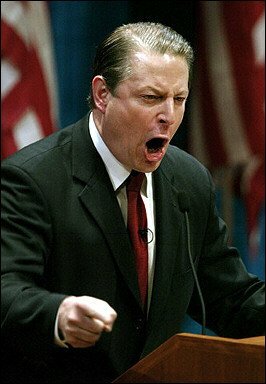 They may soon find that, like their new icon Al Gore, they don’t know nearly as much as they think.